The Torah portion that we read this Shabbat begins in an atmosphere of tension. 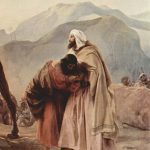 The brothers Jacob and Esau are about to meet again after many years of estrangement. Jacob wants to create a good climate for their meeting, so he sends messengers ahead of him. Ramban says that this is what a person should always do, prepare so well for an encounter that any possible tension will have dissipated in advance. Ramban’s advice motivated an experience I had some years ago. As chairman of a committee I knew that there was a dispute between two committee members, so the day before a scheduled meeting I had an off-the-record chat with the two of them and we ended up agreed and smiling. When the committee had its meeting all went well and there were no fireworks – the Ramban method at work! Ramban’s advice applies not only between human beings but between man and God. The prophet Amos says (4:12), “Prepare to meet your God, O Israel!” This is what we do when we say the central prayer, the Amidah. We praise God for what He has done for us and our ancestors, and only then do we formulate our petitions. The answer isn’t that our praises make Him any greater or happier, but they identify who it is that we are addressing in prayer – the tried and true God who has brought such meaning to our lives.